This just out. A Dietitians of Canada (DC) press release that provides their explicit support for posting of calories on menus in restaurants! Regular readers will remember a few weeks back when I posted my concern that DC was actually going to come out against mandatory restaurants menu labeling. 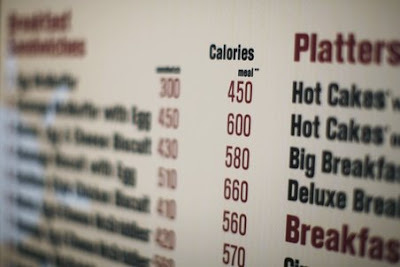 They had sent out a loaded questionnaire that reported they had their own concerns and then a spokesperson came out and suggested that putting calories on menus might cause Canadians who were reading them to misinterpret them as some sort of taste-o-meter reading and aim for more of them. All I can say is kudos to DC for finding the right path on this issue and thank you to all of my dietitian and non-dietitian readers who wrote DC with their concerns.